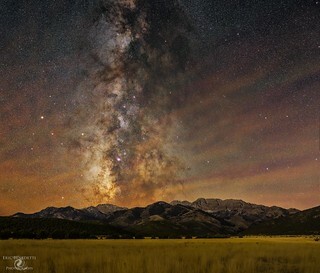 They say it's not over until the fat lady sings, well the fat lady ain't signing on Milky Way season just yet. I haven't shot the Milky Way in almost 2 months thanks to traveling, my work schedule, and my mother's health problems. So I decided to get out tonight (and hopefully the next few nights if the weather cooperates), I drove about 45 miles east of Salt Lake and shot at the foothills of the Stansbury Mountains. The core is nicely aligned with Deseret Peak this time of year and I've never shot out there so I figured I'd give it a try. Still quite a bit of light pollution from the Salt Lake Metro area, but I was able to get some decent detail out of the core region. I've also never seen airglow like this before, I usually get green bands with some faint red bands, this is more of a rainbow with green, red, purple, and orange, quite amazing. This is two shots, one for the sky and one for the foreground, shot with my Nikon D600 and Sigma Art 35mm f1.4 lens on a Sky Watcher Star Adventurer mount. The sky shot is a 2.5 minute exposure at ISO 800 and f4, the foreground is a 3 minute exposure at ISO 800 and f4, merged and edited in Photoshop and Lightroom.